In my opinion, there are a few advantages of using REITs as a financial instrument to build wealth. The advantages can vary. You have to establish if it’s a fad. Then, you have to see how it could fit into your overall wealth building strategy. You have to see if as an asset it does generate positive expected returns. Then you need to understand how volatile it is. Next, does it have the characteristics that fits your temperament. There are some investments that are easier to understand than others. When investments are easier to understand, it makes it easier for you to take action. When you build on to your existing set of knowledge on something, that is also easier. REITs are a specific set of investment assets that are based on real estate. In the Asian context, real estate has a large mind share that real estate is meant for building or storing wealth. You will have relatives, friends who somehow dabble in real estate and you may be able to pick up some tools of the trade (might not all be relevant and likely a lot of misconception!) from them. Thus it is not something new to you. You will be able to bridge the gap from not knowing to knowing adequately much faster than if we are going to bring you up to speed with general stock market investing. This is the advantage of a segment of investing assets that are compartmentalized. It is easier to brand, to focus upon. 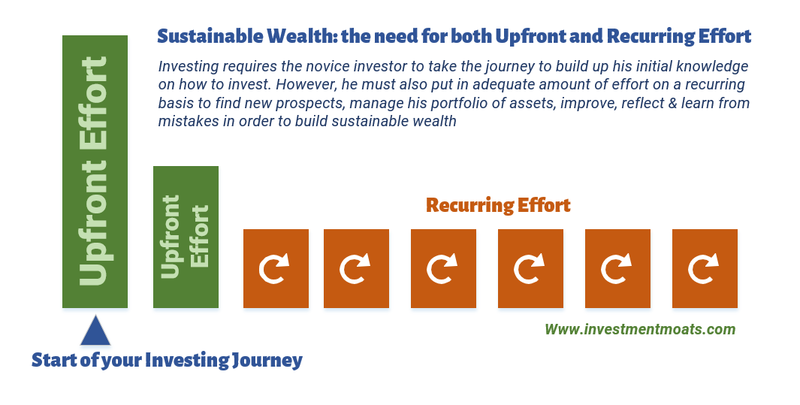 In some of my past articles, I explained that some form of wealth machine(s) can only be sustainable when the investor reaches an advanced level. I would say being a trader, a stock investor are some examples. To invest in REITs, is like specializing in only one sector of many sectors that the stock investor usually covers. This means that to gain competency on REITs is much easier and shorter. How to invest in REITs is important, but it is also much less than general stock investing. Thus I believe to build wealth in a sustainable manner, it does not require an investor to be so advance. Some investor who is willing to invest in the effort upfront, and then recurring just have to reach an intermediate level in order to do well. REITs tend to have the same components as stocks which make them viable as a financial instrument for both accumulation and de-accumulation. If you are in the wealth building stage, you can invest in REITs to compound your wealth. In 10 years, you would have accumulated $423,000. In 20 years, at age 50, you would have accumulate $1 mil. In wealth de-accumulation, in which you spend down your portfolio, you can choose to withdraw only 4% instead of 6% of the total return. You could choose to spend only the dividend portion of the total return. At 40 years old, your $423,000 could provide $16,920/yr in cash flow, or $1,410/mth. For most people nowadays, they treat their wealth as a backup plan. They have not clear reasons, but accumulate as a form of financial security. In this case, you can envision yourself accumulating wealth with REITs, and then using the dividends to fund a sabbatical or a short 1 month unemployment. The first REIT was introduced in Singapore somewhere in 2002. Thus, in Singapore we only have a short 15 year history. However, REITs are not new as a set of financial instrument. REITs originate from the USA somewhere in the 1960s. Back then, REITs are not listed and through the next 55 years, they underwent a form of maturity. In Asia, Australia and Japan have a more matured REIT market. They also undergo their own timeline of maturity. It is only in the 1990s that we see more REITs listed on the stock exchange. Prior to that, they exist as unlisted. In fact, in various countries, you can see investors come together to form partnerships, corporations to acquire a set of commercial properties and act as landlords. Many of these partnerships are private. In Australia, there are listed REITs and there are unlisted whole sale funds. The owners of these funds raised money through private investors to purchase a set of properties. From its colorful history, we can see that investing in REITs is like any real business. It goes through various periods of booms and busts. We can also see the levels of maturity from a mistrusted investment instrument to one where there are more transparency and disclosure. An investment asset is worth investing in if it helps you build wealth over time. By building wealth, I meant that over time, its investment value can go through various ups and downs. Eventually, if you hold on to it, its returns should yield a positive expected returns. 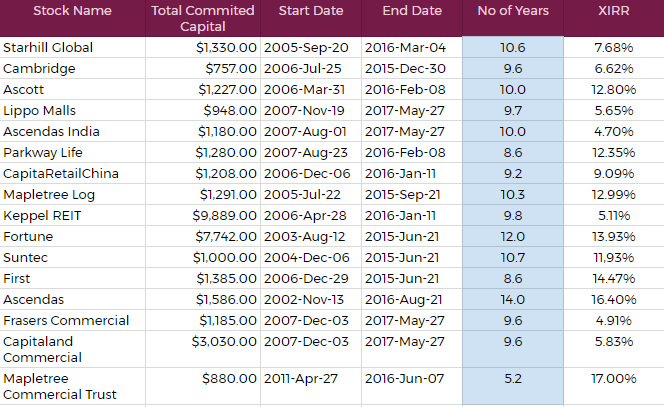 The market with the longest REIT history is USA. Apart from the recent 2007 to 2009 great financial crisis, the REITs have been competitive versus stocks in providing positive expected returns. The Australian REIT market is longer and it shows similar characteristics. However, if you have purchase REIT during times of irrational exuberance, then you might not enjoy positive expected returns. How would we do if we bought a lot of REITs during their IPO periods before 2007 and held it to somewhere closer to today? A lot of the REITs was listed in 2006-2007, right before the price plunge. During that period, many REITs have to do rights issue which is to request additional capital from existing shareholders. On the average they have 10 years of history. The XIRR stands for internal rate of return. The best way I felt to explain XIRR is: What if you treat a REIT say First REIT as a fixed deposit? If your capital stays the same, what kind of “interest” yield will you get per year? Majority of the tracking takes place in 2006 to 2016. There are some that performed really well. The tracking for them probably started when the markets was at their doldrums (Ascendas REIT). However, you can see a lot emerge from that GFC well when the price went nowhere. Had you participate in all the rights issue if there is. The XIRR for the STI Index is probably closer to 5 to 5.5%. So we can do a comparison. In the previous example, we simulated the returns if you lump sum invest. However, what if you spread out your purchase yearly in the middle of the year? The results are not too shabby. Granted many of the tracking started in Jun 2008, where the prices have already started falling from the top (but there are more falls to go). Prices have meander around the same price range. This makes this result to be rather decent. Retail investors across different country usually start their real estate journey in residential properties. And when it comes to investing, many of us stayed in the realm of residential properties. Investing in properties requires a large down payment. Suppose you would like to invest in a condominium for investment. The full price of the condo costs SG$1.5 mil. A typical down payment would cost you $300,000 if the minimum down payment is 20%. Under certain restrictions, the amount of loans you could borrow could be only 60%, or 40%. These stipulations change according to government policies. Thus down payment could be $300,000, $600,000, $900,000. For some investors, they require some time to accumulate $300,000 for the down payment. In the mean time, they have to find some ways to grow their money. The costs of commercial and industrial properties is much more. This would mean you need a larger initial capital outlay. 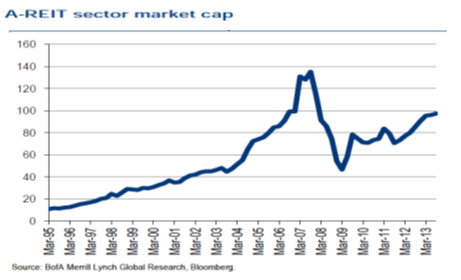 This can be daunting for an investor to come up with. It is like a form of listed business where you have a manager that manages the real estate assets. As a shareholder, you take a partial ownership of this listed business. The manager, will deploy the capital of the shareholders to purchase a group of real estate assets, engages a property manager to take care of the properties. As an investor you will earn dividends and capital appreciation (or depreciation if you buy at poor prices) for putting your capital at risk. Your reward is similar to owning individual properties (cash flow yield + capital gains) but the structure is different. It is vastly easier to own a partial ownership of a REIT. My dividend stock tracker lists the prevailing unit price of the REITs. We typically purchase shares in lot size of 100 or 1000 in the past. This means that if you have around $3000 to invest, you can purchase $3000/$1.32 = 2,200 units of First REIT. First REIT unit price currently is $1.32 and gives a $0.085 dividend per unit for the past year. This will provide a dividend yield of 6.4%. Contrast this to the capital outlay you require for an individual property. And we could participate in ownership of property segments that we cannot do easily on our own. 6. REITs provides a Total Return of Dividend Yield and Capital Growth. REITs should be evaluated based on their Total Return and not just the dividend yield. This is a very common rookie mistake. They just go for the highest dividend yield REIT. There are some REITs that have a high dividend yield but difficult to acquire growth and there are lower dividend stalwarts that are able to acquire, carry out asset enhancement and have higher organic rent revision. As a REIT investor how does this total return reach you? We can use the example of two good friends Mary and Ann, who decide to form a company and purchase their first condominium. Interest only Debt: 30% at an interest rate of 3%. They rent out the condo at a gross rental yield of 10%, and after the expenses, the condo gives a net rental yield of 6%. The cash flow of this company that Mary and Ann formed derives from the net cash flow from this one condo. As a company, the dividend yield for Mary and Ann’s company is higher because of the leverage. The dividend yield works out to (6% -3% x 0.30)/0.70 = 7.28%. This company pays out 100% of the cash flow to its shareholders, who are Mary and Ann currently. When Mary and Ann spot another property that have an NPI yield of 8.5%, they can find new partners, giving this new partners new equity in the form of share placements. However, this property is attractive. The NPI yield, which is the net rental yield of the property after expenses is 8.5%, which is higher than the leveraged dividend yield Mary and Ann is enjoying now at 7.28%. By bringing on board new investors to purchase this new property, they are able to bump up their dividend yield higher than 7.28%. Overtime, the properties become more valuable (due to the market or due to the actions of the managers) and thus investors are more willing to pay more for the company (which owns these set of property). 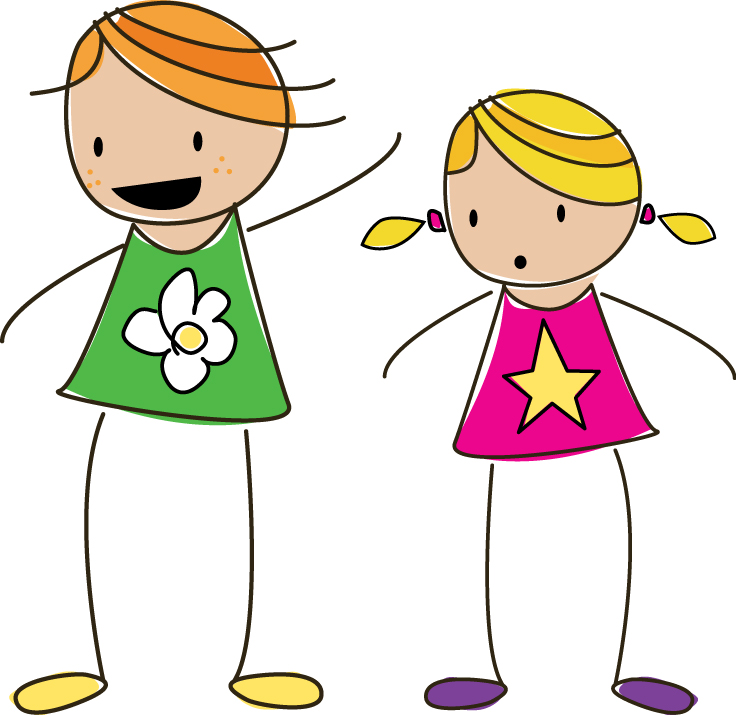 Mary and Ann can sell off a part of their shareholdings at a higher value than initially. External partners recognize the value of this partnership more and are willing to pay more to be part of the partnership the equity of Mary and Ann as the original share holders also grows over time. If you are interested to read up on the various ways REIT can grow, you can read this comprehensive article that discuss how REITs grow. 7. REIT will allow you to Achieve Diversification of your Cash Flow. In Singapore, the typical investor are able to purchase 1 or 2 properties. To service the debt (which are usually amortizing debt that you pay off the principal + interest), you have to rent it out. If the property is not rented out, you will have to service the debt through your own cash flow. Therefore, who you rent to, how much you rent for becomes rather important. There is only one source of cash flow. During a downturn, it becomes a tenant’s market. There will be an invisible ceiling to how high you can rent for. Some properties may go for 1 or 2 month (or even longer) without rental. This creates stress to continue to service the mortgage. In REITs, the manager manages a group of properties so it means that your rental cash flow is diversified. It is common that in each property building (unless it is single tenanted or master leased to a single customer) for the property to have many units that will expire in different years. These tenants also leased the properties for different tenures, so you achieve another form of vacancy risk management. This result looks negative, but if the manager is competent, the manager would be able to limit the unoccupied space, or rent well when the demand for property is restored in the upcoming cycle. Mary owns an investment condominium and was renting out well. When times are not good, it is a renters market with more supply then demand. Mary may have a few months of vacancies which will affect her mortgage servicing. She would have to accept lower rent to keep it occupied. In contrast, a grade a office REIT such as Capitaland Commercial owns a few office building switch numerous office spaces. They have a few anchor tenants leasing a large part of the space but also smaller tenants. When times are challenging, the manager of CCT will need to show their expertise in retaining tenants, and get new tenants. As a REIT investor in CCT, you have that managerial expertise to tap upon compare to doing it yourself. As the tenant base is diversified, the lease tenured is also staggered, say each year only 20% of CCT spaces are up for renewal. As you are buying share ownership of a company on a corporate level (when you buy shares on the stock market), the debt refinancing and other forms of risk management is taken care by the REIT manager. Some REIT manager will do better others will falter. However, if you become unemployed, you do not have to worry about not able to service the ongoing mortgage. As a REIT investor, you may have set aside say $1000/mth to invest in stocks or REITs. If you lose that income, you can hold off the purchase. While REITs are not strictly an asset class (having said that in the USA they have taken REITs out of Financials and made it a sector on their own), you can make use of REITs in various different strategies. The investment asset should firstly satisfy your strategic or tactical investment plan. As a pseudo bond for capital you cannot deploy. A bond unless default protects your capital. However, the yield on investment could be low. A favorite position of mine is to find quality REITs with good management at the right part of the cycle to hold a portion of capital. By doing this, you do not lose too much opportunity cost compare to if you have put all your unused capital in cash. You can actually earn a more decent return. The caveat here is that you have to pick the right REITs at the right valuations. Cyclical Speculation. For investors who are so focus on this REITs niche, they are able to pay attention and realize the nuances of the property cycles much better than general stock investors. They may be able to purchase REITs that are coming out of beaten down REITs in challenging conditions to time them when the property cycle picks up. In investing, a good overall plan drives results more than the question of which REIT to buy. As illustrated, an investor can purchase a REIT for different reasons. If you are unsure about the role that your REIT plays in your overall plan, then you may suffer and make a poor investment decision on your REIT. To invest and build wealth in a fundamentally sustainable manner, not many things are truly passive. Most investing methods require an upfront lump sum effort to learn, understand to ensure you know what you are doing and what you are putting your wealth into.. There is also a recurring effort to ensure you manage and maintain your financial assets, pruning and reinvesting them in a sustainable manner. The Trust Manager also makes strategic recommendations on debt management and other forms of risk management. In return, you as the investor pays property management fees, trustee fees and managerial fees. Compare this to individual investment properties that if you want to be more hands on you engage a property manager which typically charge you 7% to 10% of your gross rental revenue. What is left for the individual investor, to assess on a recurring basis is the REIT and Trust Manager fulfilling your investment objectives in a manner ideal to you. 10. REIT investors through the REIT can tap various types of Corporate Financing that they otherwise do not have easy access to. The typical investors when purchasing investment properties, usually access to bank mortgage debt that is amortizing. In the case of certain speculative purpose some tap upon interest only debt. However these are loans on a personal capacity and if they are hit by unemployment and run into cash flow issues to service the loan, it may be difficult to work out with the banks to extend the duration or restructure the financing. 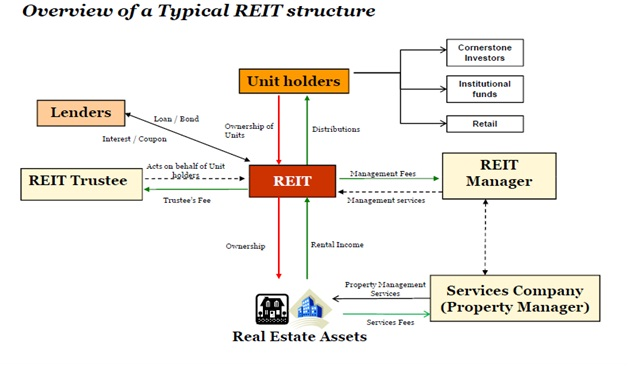 For REITs, similar to listed businesses, they have assess to various forms of financing such as bank loans, medium term notes, preference securities, additional share placements to other investors or existing investors. On a corporate level, whether the financing is to purchase more accretive investment properties or to refinance current debts, a REIT have more courses of actions. You can read more of the various forms of capital a REIT could tap for growth in my comprehensive article on how does a REIT grow? Their flexibility and availability just like the connections and access to good financing for an individual will depend on the performance of the reit, it’s size and also the sponsor entity backing up the REIT. Caveat: Due to that the REIT is already leveraged it is not a good idea for the REIT investor to leverages the stock further as a credit crunch might result in a margin call causing great distress. In various forms of investment, there is an issue of liquidity. Liquidity refers to how easy it is to sell your investments at the appropriate price. Stocks, depending on the type of stocks can be rather liquid. This means that on a stock exchange you can find a willing buyer to sell to. However, unlisted assets like property, art and precious metals might not be so simple. Most people realize they might have made a mistake when the market starts to turn. In those situations they might not be able to sell their investments fast, and at the price they want. During those times, there are more sellers and no buyers. To attract the buyers, the sellers have to outdo each other to list at lower prices. REITs are listed on a stock exchange, they are more liquid. When the market turns, the same situation as unlisted properties will occur, but because there is a live exchange that allows prospective investors to observe and take the shares off sellers, you are likely to sell off with lower friction. In normal times, if you gain more competency and realize you have made a mistake in your evaluation of a REIT, you could sell off that share ownership. Compare this to properties, where you still need to weigh the closing costs, see whether there are buyers, how much they would offer, and would they eventually follow through with the transactions. However, while we list many advantages, it is not without its challenges. One of the biggest I feel is that people looking at REITs too simplistically. They purchase REITs as if its a fixed deposit and are shocked when it doesn’t behave as such. Its advantages will only be beneficial to you if you treat investing in REITs as a form of serious profession. One thing about REITs is that you need to maintain a significant cash portion to handle rights issues, especially during recessions. Rights issues can be either yield accretive or yield depletive, depending on the purpose. Hi Sinkie, good point you raise. However do you agree that you always have the option of going for a larger well capitalized REIt. Yes, if you decide to seek a higher yielding possibly more risky REIT, then you have to set aside capital. Can I check if you are the same Sinkie in HWZ? Right issue does not necessary results in share dilution if the DPU is maintain. You will still receive the same amount even though the Reit’s share base has increase. So, it’s OK if you don’t have excess money to participate the Right Issue. Of course if you have some spare money, you would just increase your shares base and receive more money in the future. the sum to get started is the same as individual stocks. be respectful of how much commission you pay. try to keep it below 0.50% in commission. so if the minimum commission is $29, then the minimum amount is $29/0.0050 = $5800. It is ok to concentrate, provided you are starting off and you consistently add more money to your wealth fund. Thank you for so many free resources. Would you consider REIT ETFs a lower risk instrument due to the built in diversification and less need to deal with rights issues, etc. If can accept the lower yield, what role you think it can play in the portfolio in wealth accumulation / retirement planinng? hi carrot, if you are comfortable investing in it as a sector. if you use it as a form of passive diversifier then yes. however, note that we would probably need to evaluate the ETF on a case by case basis.